ESA had high requirements on the physical fitness and health of all team members. So we had to visit the European Astronaut Centre and passed a bunch of tests including a pressure chamber ride. 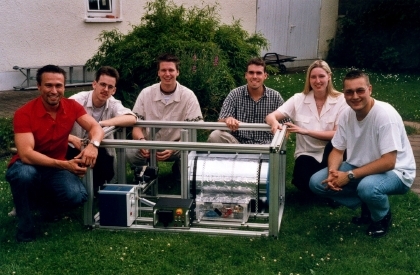 From left to right: Alexander Herz, Gerald Vetter, Christian Banse (back-up), Nils Schweizer, Kim Seip (back-up), Michael Rösch, not shown on photo: Matthias Wejwoda (back-up). After the 2001 campaign Alex and Matthias left our team and Christian joined our team permanently. Later on Marc Kirchner increased our team for the next campaign. Now we were ready for the campaign 2002.